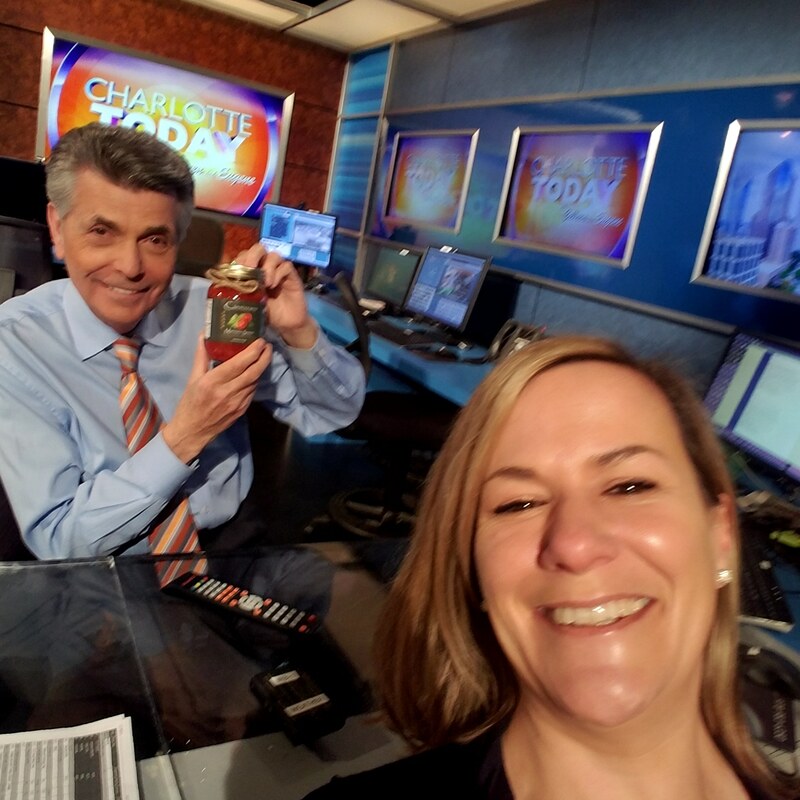 Cannizzaro Sauces on Charlotte Today! We made Zucchini, Prosciutto & Mozzarella Roll-ups today! and got to meet Chris Kattan! Charlotte Today 7/12/18 – Lasagna Stuffed Patty Pan Squash! 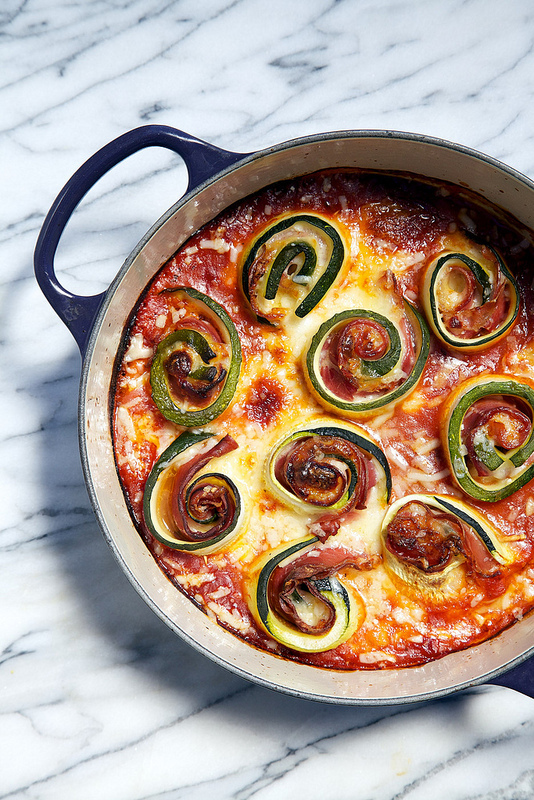 We made Lasagna Stuffed Patty Pan Squash – they are ADORABLE! Every item was purchased at the Matthews Farmers Market – EVERYTHING! 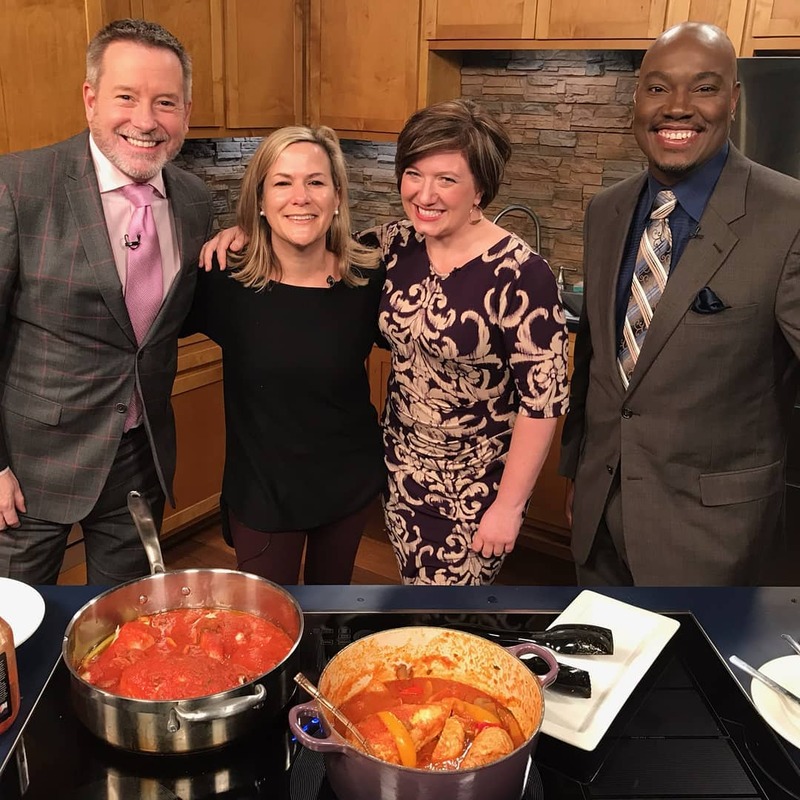 Cannizzaro Sauces on Charlotte Today 3/9/18! Chicken Cacciatore! We had so much fun! Check it out if you missed it – such an easy and delicious recipe! We also got to run into Mr. Larry Sprinkle! We made Paella (Cannizzaro-ized) and Shakshuka! Here is the link! Fox 46 Good Day on 2/25/18! 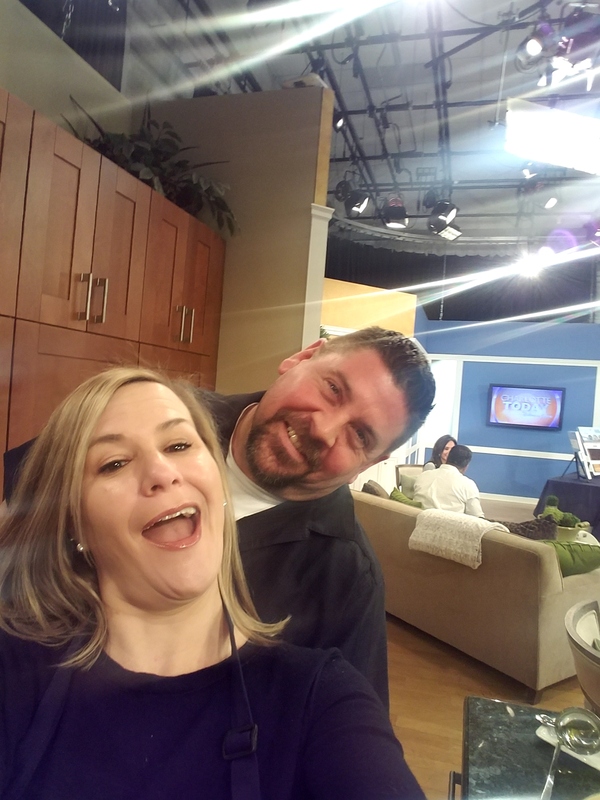 Did you see us on Morning Break on WBTV on 2/23? If not, here is the link! We had a blast – thanks to Chirs, Kristen & Coach! We made our meatless “Bolognese” Sauce – it was fabulous! December 2017 Edition of Charlotte Magazine! What great fun we had! Andrew and Melanie started their business selling a marinara sauce. They’ve added several more flavors since, including a vegan option. SIX DAYS A WEEK, at 4:45 in the morning, you can find Andrew Tritten and Melanie Cannizzaro-Tritten in the kitchen of Bonterra Dining & Wine Room, where Melanie has worked for 16 years, with pots of locally grown tomatoes and herbs freshly clipped from their backyard garden. Cannizzaro began as a gift the owners would give to friends. 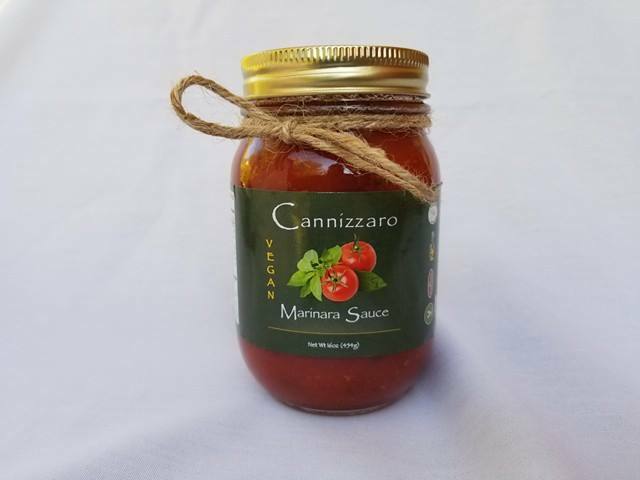 After years of making small batches of her homemade sauce for family, friends, and anyone who’d take a jar, Melanie and her husband decided, in 2015, to launch Cannizzaro Famiglia—a business selling fresh, Italian sauces, made in Charlotte. If you frequent the Atherton Mill farmers’ market, you’ve probably seen the mason jars of sauce with simple black labels and twine tied around the top. Just as familiar are Melanie and Andrew themselves—they’re often taking part in local TV news cooking segments or handing out samples of their marinara sauce at grocery stores. The couple has made sure to take the process slow and avoid taking on more than they can handle. When it’s time for them to expand, Andrew says, they’ll still keep all operations in-house. They have no intention of hiring a co-packer to mass distribute their sauces. Andrew says establishing a cooking facility of their own is the only way to ensure the sauces are made with fresh ingredients—an aspect of their business he says will never change. The original recipe started as a milder marinara sauce. Now, you can find five Cannizzaro sauces, including marinara, mushroom marinara, vodka, and arrabbiata—Italian for “angry,” and a sauce with quite a kick. The fifth, a vegan-friendly sauce, was released in October. Andrew Tritten and Melanie Cannizzaro-Tritten make their sauces in the kitchen at Bonterra. The sauces are now available in more than 120 stores, from local grocers to large retailers such as Whole Foods. Andrew and Melanie agree that the support system that’s come from being small business owners in Charlotte has changed the way they operate—personally and professionally—on a daily basis. For the best sauce, tomatoes are skinned and seeded by hand, and roasted. Come out to sample with us! We will be filling the shelves at all of our wonderful stores just as fast as we can cook it too! Same NC Tomatoes, Fresh Herbs and Vegetables – just no dairy! When customers take the time to write to us, we are just blown away.